Neolithic architects built a dark chamber that, on the shortest day in the calendar, the Winter Solstice, is flooded with warm sunlight. Around 5000 years on this event is being transmitted over the web. Maeshowe in Northeast Orkney (captured here by one of the three web cams) is one of the largest and best-preserved prehistoric monuments in Scotland. A chambered cairn shaped like a blunted cone it measures 300 feet (91 m) in circumference, and was encircled by a moat about 90 feet (27 m) from its base. It is believed to have been built as a tomb for a chieftain family around 2500 BC. It is also famous for its Viking graffiti, left by a horde who probably sheltered there around 3,500 years ago. The cairn is probably the same age as the famous nearby standing stones of the Ring of Brodgar. Inside Maeshowe - these walls made of packed stones and clay have stood the test of time well. The long passageway down which sunlight shines in mid-Winter is the centre of the picture. Each day in December the setting sun moves incrementally across a narrow South Westerly doorway in the cairn. The doorway leads down a 11 metre (36 ft) long narrow passage, which opens to the large inner chamber (4.6 m/15 ft, pictured above) which it is believed was the burial chamber. On the Winter Solstice, around the 21st/22nd, the sun drops to the point where it shines directly down the passageway, lighting up the back wall of the cairn and flooding the inner chamber with soft light. There is no doubting the skill of the architects of the Maeshowe cairn, but what has also captivated the imaginations of contemporaries is the likelihood that the building was not just a marker for the shortest day of the year, but that it was constructed as a measurement for a megalithic month starting 23/24 days before and after the Solstice. Others have speculated that the sun represented a rebirth or a fertility rite, and that at earth's darkest hour the souls of the dead were carried away by the sunlight. Another theory suggests that just as the midwinter sun marked the return to life the entry of sun into the tomb marked the continuance of life of those who had passed away. For many years, Orkney photographer Charles Tait has recorded the movemnts of the setting sun with his Maeshowe webcams. With the permission of Historic Scotland, the government agency that manages the heritage site, he will be webcasting images again from late November in 2016. 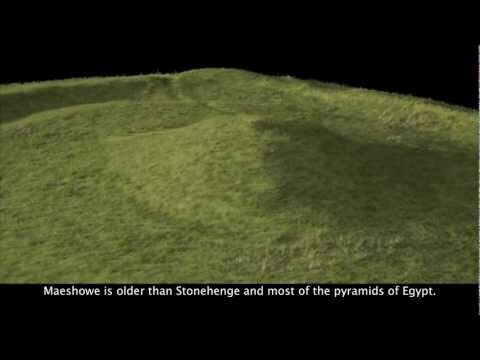 Images will appear from 09:00 to 16:00 GMT each day (outside camera) and 14:00 to 16:00 GMT (inside cameras) If the inside images are dark there is no light in Maeshowe. Bear in mind that there will inevitably be days when because of bad weather there will be no sun: this is the North of Scotland remember! If the interior cam image is dark it means that the sun has not entered the chamber yet.